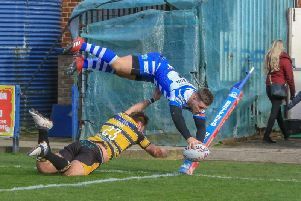 Halifax can open a six point gap over top four rivals Batley in Sunday’s fifth-versus-sixth Championship showdown at the Shay (6.0). But boss Richard Marshall says he is more motivated by the desire to atone for his team’s dreadful performance in round two, when they slumped to a 24-6 loss at Mount Pleasant in an utterly one-sided contest. “We were out of the game before half time that day; they bullied us and out-enthused us,” said Marshall, whose side currently head Matt Diskin’s outfit by four points. “Looking back, I didn’t like the whole atmosphere surrounding that game, we just didn’t perform at all. “We didn’t get the preparation right, we didn’t get the plan right and we didn’t get the team selection right. “I took some responsibility for that, and the players took responsibility as individuals for that. “Putting that right is what gets me going and I don’t envisage us being out enthused this weekend. “I am not the best coach in the world, and this is not the best team in the world, but what we have done as a group over the last two and a half years is learned from our mistakes and misfortunes. Marshall conceded that a home win would be extremely damaging to the Bulldogs’ play off chances, with a defeat for seventh-placed Sheffield at Featherstone potentially turning the race for a top four finish into a five horse race between Fax, London, Rovers, Toulouse and leaders Hull KR with a little over half the season gone. “If you look at the league table, I can see why people might think that,” admitted Marshall. “I try not to get distracted by all that stuff, but it is a big game for both clubs. “I think we could lose and still make the top four, so in that sense I think all the pressure will be on Batley.